Check out this 86 IROC convertible with only 26k on it. I am not sure what to think about it. Is this an ASC conversion? The brake light mounted to the truck, LG4 motor and base interior. It’s just an interesting car. I’d rather pay way more for a different car.. I don’t know if I’d buy that car for $5k because I just can’t get past a number of things.. It's not an ASC conversion. The top is all wrong, no caps on the 1/4 panels, etc. Can't remember the name associated with that conversion, but it's not an Autoform 2-seater either. Kind of like Backyard Bubba's Sawzall Customizing. Convertible conversions while you wait! I had no idea so many different companies did convertible conversions. Firebird/Camaro info is about halfway down this Wikipedia article. Thanks for the info, wonder which company out of this army of them did it. Note: Factory convertibles were built by ASC starting midway through the 1987 model year. Last edited by burnout88; 09-14-2018 at 07:29 PM. 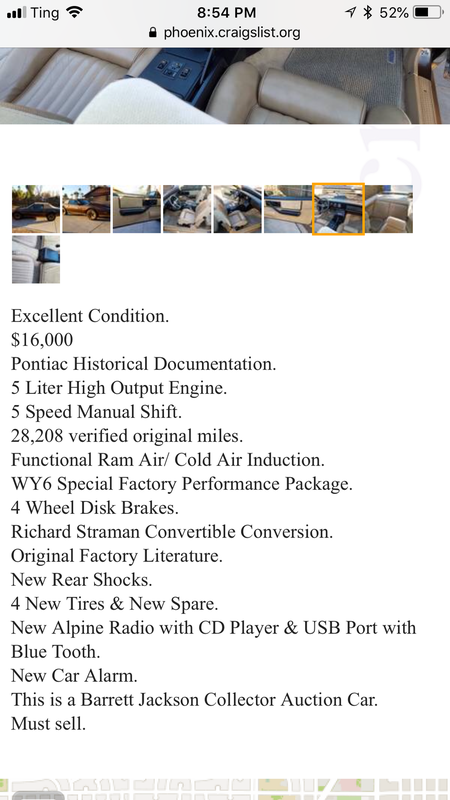 The Arizona trans am listing indicates Richard Straman. Good catch! That makes sense and matchs the list. Looks like Convertible Concepts Ltd from the list matches. The time frame also matches both the 84 and 86 car. 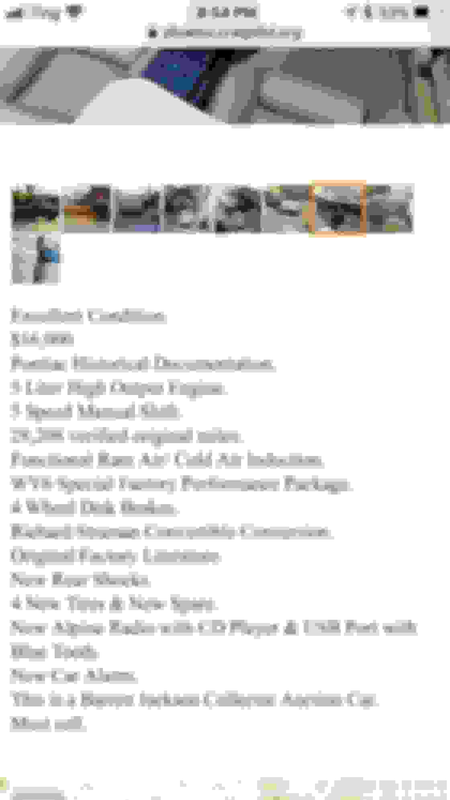 "Convertible Concepts Ltd. (by Straman on West Coast or Auto Sunroof Inc on East Coast 1982–1987),"
Last edited by burnout88; 09-15-2018 at 11:43 PM. Both great cars that if not for that period, then desirable modification. But would not have survived until today had they not been converted. But these do look better top-up than some conversions. I’ve never driven a thirdgen convertible, therefore I have no basis to comment on the current greatness of either car. The Camaro in the first post does not have original upholstery. The original vinyl would not have been perforated, if that was even available. I think in '86, cloth was standard. I also find it interesting that it even has power mirrors, but no custom cloth seats or door panels. And yep, that third brake like is fugly. I don't mind it on hatch glass, but it's simply awful on that deck lid. Last edited by burnout88; 09-16-2018 at 07:35 PM. Did some checking on Richard Straman Coachworks. This was not a chop shop by any means these were high dollar conversions. His shop is know for converting Ferrari’s into convertibles. I can't get over the poorly fit seam on the trunk lid. Part of the functionality for the top down perhaps.